Yes, I still exist, and sometimes I even get around to making something! 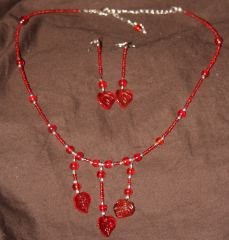 I made a new necklace and earring set the other day. 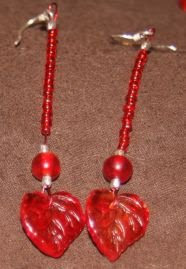 Actually, other way round, I made the earrings first (which I like) and then the necklace (which I don't like). So given all that, I'm going to sell them. Hopefully someone will buy them! It will be my first trademe sale if someone buys them! Anyway, for your viewing (I'd say pleasure, but, well, as I said, mixed feelings on this one).